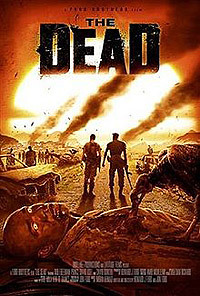 The Dead (2010) - Sci-fi-central.com.  UK  2010  105m   Directed by: Howard J. Ford, Jonathan Ford.  Starring: Rob Freeman, Prince David Oseia, David Dontoh, Ben Crowe, Glenn Salvage, Dan Morgan, Julia Scott-Russell, Laura Jane Stephens, John Dunton-Downer, Nelson E. Ward, Mark Chapman, Anne Davaud, Gaal Hama.  Music by: Imran Ahmad. Several things struck me watching this a second time. The Dead reworks disaster iconography to really great effect. I wonder whether the film makers realise how effectively they have used the way we're conditioned to see Africa. That is either as a locus of disaster and suffering on the one hand or a timeless landscape of incredible natural beauty on the other. The visual conventions of disaster journalism are employed superbly: Severed limbs and amputees evoke footage from the civil wars of Liberia and Sierra Leone. A convoy of army trucks rumbling through an unnamed African country with mean looking soldiers in sunglasses. A solitary figure running crying and screaming through the bush. (Look closely in this scene and you see the Jeeps have Ghana plates). Consider the amount of news footage we have in Europe or America of displaced Africans waiting aimlessly around. These contrast with the sheer beauty of the landscapes and setting of the film and intricate attention to lighting and camera work. Shooting in this climate presents considerable challenges such as shorter daylight hours, humidity, dust, visibility and the film makers have surmounted considerable technical challenges. Some commentators describe the film as racist. Flesh devouring, cannibalistic zombies? The walking dead? It can be argued the film is an allegory about a continent which has literally been devoured for centuries by Europeans and more recently by corrupt Africans themselves. There's some tacky scenes for example where Murphy rescues a baby. I think these can be problematic if one considers the film literally. It might be that by having a scene as corny as this the film is commenting on other films, making us aware of how most films always position the US as the Good Guys who are coming to save everyone else. Films are not just entertainment products, they reinforce the ideology of a culture and this reviewer can't make out whether The Dead is reinforcing, or challenging the ideology of White America, that is it's beliefs, thoughts and assumptions. The ending is likewise problematic for this reviewer. We see an American man with a cute African child with dreadlocks, gazing out at the camera. By doing this it can be argued the film positions Africans as being childlike -' not fully capable, not fully adult. The child's father, Sergeant Daniel, has been attacked by the zombies then to all intents sacrificed, left beneath a tree by Murphy, to die. This raises another problematic which is that the film obeys Hollywood conventions whereby the Black character is there to save the white protagonist. I may be reading too much into what after all is only a film but cultural products like films reveal, whether intentionally or not, much about the culture from which they emerge. To conclude. The slow moving zombies generate a powerful sense of constant threat and tension. The pacing and suspense are well maintained and there's enough gore and shocks to delight horror afficionadoes. Scratch beneath the surface and the film becomes more interesting on a number of levels. Whatever problems the film raises are not necessarily the fault of the filmmakers who are to be commended for shooting in West Africa and bringing in local crew and cast, such as Prince David Oseia who is a household name in Nigeria. While the stunning, timeless landscapes in which the film is set are one of the ways we're conditioned to see Africa, that part of Burkina Faso really is as amazing in real life as it is in the film. Maybe The Dead will inspire more people to visit this corner of Africa. Review by trpuk1968 from the Internet Movie Database.